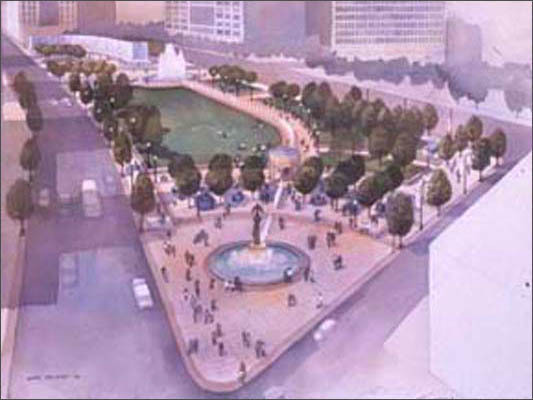 Olympic planners envisioned Woodruff Park as a strategic open space in downtown Atlanta for the Centennial Olympics in 1996. The International Peace Fountain unifies the park with an exuberant water display that commemorates Atlanta’s pivotal role in the world wide human and civil rights movement. Woodruff Park celebrates a revitalized downtown with an elegant and sophisticated design that has dynamic pedestrian spaces to accommodate Atlanta’s major events. Phoenix Rising, a 1969 bronze was relocated to Woodruff Park as part of the $5 million dollar renovation. The statue is a focal point of the park’s Five Points entrance. The International Peace Fountain is located at the intersection of Peachtree Street and Auburn Avenue. The fountain commemorates Atlanta’s unique energy and culture, and her legacy for the twentieth century.